GET LOST AND FOUND IN A STORY. The Baltimore Job Hunters Support Group is performing two staged readings of our play "Big Work" as a fundraiser in Baltimore on Friday, October 26 and Saturday, October 27, 2018. Support a wonderful cause and see new theatre, all in the same evening! In an interview for the Boston Podcast Players, Melissa and Kate dive into what drives them to make documentary theatre, why they created a podcast about identity, and the new play they are currently researching. They also share an excerpt from their play, "Big Work," and how their own feelings about work were the impetus for writing it. Each episode of our podcast Identity Tales examines our universal search for belonging through a conversation with one outlier, and explores the joy and connection that comes from owning one’s story. Subscribe on one of the channels below. We believe that story is a powerful tool for fostering connection, and that when one person shares their story, it empowers others to do the same. 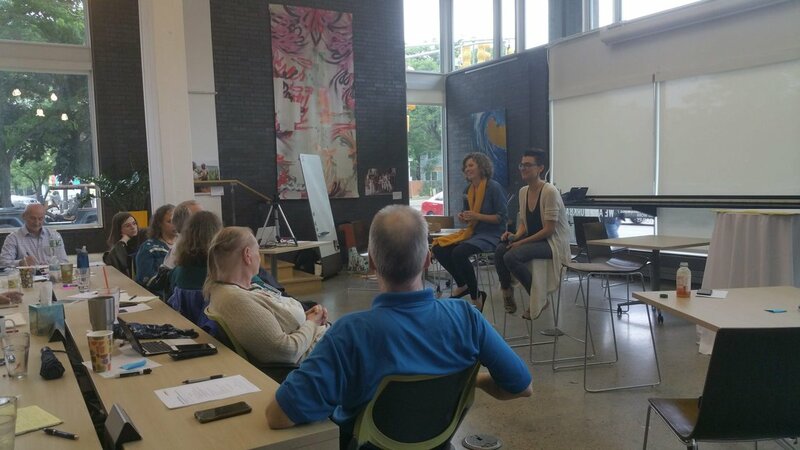 We lead and participate in community events and workshops on thematic topics related to our plays, and on the theatre's role in helping us to forge connections with one another around issues of identity and community. Recently, we've lead workshops and story slams that help people explore their relationships to their jobs and the ways they wish they could connect with others. To collaborate with us on a workshop, please contact us. Listen to Our Original Play, "Big Work"
Big Work weaves together verbatim excerpts of interviews with 17 strangers into a modern day meditation on the American Dream and how we define success and ourselves in the 21st century. Portraits of these real people reveal the rich inner lives we all lead, and beckon us to explore what questions we should be asking in order to truly know one another. The original cast audio performance of Big Work is available on iTunes (under Audiobooks), Audible, and Amazon.com. Our mission is to foster understanding, empathy, and human connection through theatre that explores uncommon human experiences, and to tell entertaining, compelling true stories. We create and perform new theatre pieces based on research and interviews with real people. Sometimes we perform our plays live in traditional theatres or untraditional community spaces. Other times we share our shows as audio dramas, updating the radio play genre for the podcasting era, and allowing more people to experience these stories. Throughout the year, we can be found in various stages of creating new theatrical work: researching, interviewing, writing, and workshopping new pieces.